My vote for the Nobel Peace Prize: the girl who defied the Taliban. Sometimes there are people who seem to have guts and moral fibre that leave the rest of us behind. 15-year-old Pakistani schoolgirl Malala Yousafzai was shot in the head and neck a year ago by the Taliban, for advocating that girls should be allowed to go to school. She had been writing a blog about life in the Swat Valley, where the Talibs were gradually taking over, forcing girls’ schools to close by threats of violence. Violence was so common that one day, when her younger brother was playing in their front yard, she asked what he was doing. “Digging a grave,” he answered. The Taliban found where Malala went to school, got on her bus and fired. The results became world news. After surgery and rehab in England, she is now (this Wednesday) on the anniversary of the attack talking about her future. She can’t go back to Pakistan yet, but she wants to improve her education, and keep pushing. She has been nominated for a Nobel Peace Prize. It’s a long shot, since there are over 200 nominees. But I hope she gets it. Malala reminds me a lot of people who have stood up against injustice, and/or to promote the cause of women. Rosa Parks may not have been shot or lynched for refusing to go to the back of the bus with the “coloured folk,” in Montgomery, Alabama, in 1955, but she could have been. Protesters in Egypt two years ago risked death in the hope of democracy. Aun Sung Sui Kee endured 20 years of house arrest in Burma for upsetting the military by winning a democratic election. The world needs more Malalas. The world need more people like you and I to give to charities that are specifically directed to educating girls in third world countries. The world needs people to put their money where their mouth is. 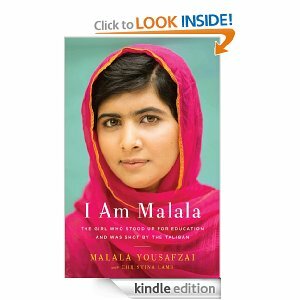 Malala has a book out, the kindle version is here, and there is a paperback in Book Depository. Best wishes until next week. I’m with you. I have always been impressed with the women who stand up to these savages. I do have to wonder, though, how many people and organizations have latched onto her. Is this coming from her, or are they using her for their own agendas, shoving her into the spotlight. She is still a child in spite of all she has been through. Either way, she is certainly more deserving than the likes of Putin.